Women in America need a raise. 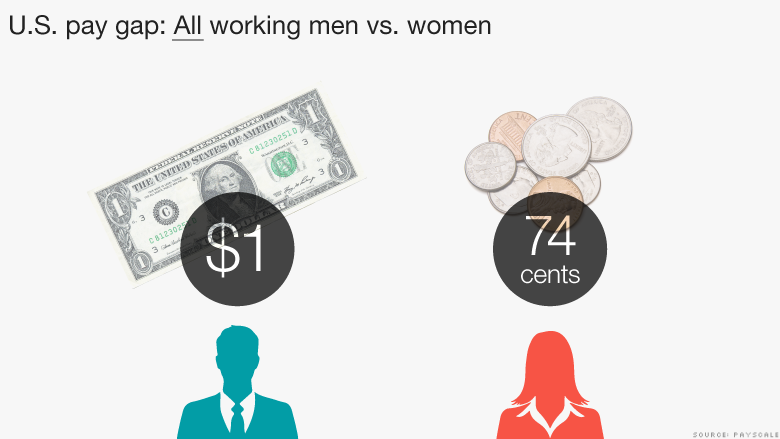 Yet another study has found overwhelming evidence that men get paid more than women. The pay gap exists even when male and female workers have the same job with the same qualifications. Overall, American women earn just 74 cents for every $1 a man earns, PayScale found after looking at data from over a million people. There's no industry where women earn the same or more than men. There's no state where women earn more than men. The gap gets worse the higher up the job ladder you go. "This isn't a women's issue, this is a family, community and economic issue," says Victoria Budson, executive director of the Harvard Kennedy School's Women and Public Policy Program. "When women are paid less, it means you have less dollars going into Main Street." 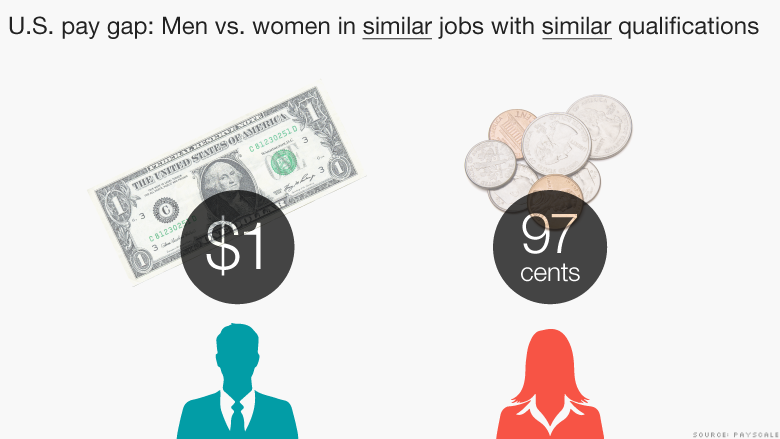 A key issue is that the most common jobs for women pay less than the typical male jobs. In America, women are more likely to be social workers, secretaries and nurses, while men are more often employed as managers, engineers and IT workers. But there's still a gap even when men and women have the same job. It's smaller, but it persists. PayScale found American women earn 97 cents to the $1 men earn even when everything -- job title, industry, experience, location and whether they have kids -- is equal. "It's really disconcerting how slowly it's changing even though companies know there is implicit bias," says Ariane Hegewisch, a study director at the Institute for Women's Policy Research. When people start working fresh out of school, the gap is low. But it grows over time. By the time women hit the top management levels, the pay differential widens. "Why is the pay gap wider at the executive level? You would assume women making it to that level are great negotiators. So I think there are a lot more factors at play," says Lydia Frank, senior editorial director at PayScale. Only 5% of CEOs in the S&P 500 are women, according to a CNNMoney analysis. Even when you look across the "C-suite" -- at the top five positions at each company -- only 16.5% of those leadership roles are held by women. Experts say the problem is two-fold: women aren't advancing to more senior roles at the same rates than men and they aren't getting paid as much even when they do get there. "Women tend to pay a higher professional cost for even requesting the raise," says Frank. While many Americans are aware of that women earn about 75 to 80 cents to the dollar that men get, minority women receive even less pay. "Women are not a monolithic group. There are gender gaps in the U.S.," says Budson of Harvard's Women and Public Policy Program. African-American women only make about 64 cents for every dollar a white man makes and Hispanic women fare even worse -- only about 54 cents for every dollar a white male earns. "I hope the conversation moving forward is: what will effect actual change?" says Frank of PayScale.